PRIMARK IS SET to reopen in Belfast after its former premises was destroyed in a fire earlier this year. The retailer’s new outlet in Commonwealth House on Castle Street will open tomorrow and will replace its store in nearby Bank Buildings, which was devastated by a fire in August. The fire took a number of days to extinguish, and 100 firefighters and 14 fire brigade appliances were involved in putting it out. 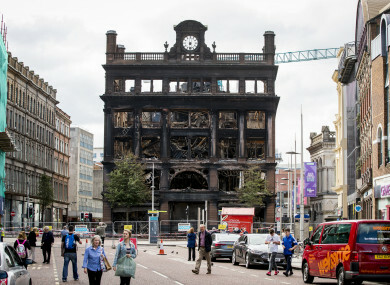 The historic building, which was over 230 years old, was occupied by Primark since 1979 and undergoing major refurbishment works at the time of the blaze. In a statement earlier this year, the company said it was its ambition to resume trading in Belfast as soon as possible to help restore footfall to the area. The new store opens at 9am tomorrow, following a short ceremony hosted by Primark director Ben Mansfield. Email “Primark set to reopen at new location in Belfast tomorrow following major fire at former store”. Feedback on “Primark set to reopen at new location in Belfast tomorrow following major fire at former store”.